Train services between Medawachchiya and Madhu on the Medawachchiya-Talaimannar line will commence on May 14 as the track up to Madhu has been completed by the Indian contractors, General Manager of Railways B.A.P. Ariyaratne told the Sunday Observer. The Railway Department on the instructions of Transport Minister Kumara Welgama is making arrangements to begin train services between Medawachchiya and Madhu on a daily basis from May 14. As Madhu is not yet populated, train services will start initially between Medawachchiya and Madhu in the morning, noon and evening. "More than 90 percent of train commuters using the Northern rail line are bound for Anuradhapura and Medawachchiya and there is no need to start a direct train service up to Madhu from Colombo. However, people who wish to travel up to Madhu can use the train service from the Medawachchiya station", he said. "We will make arrangements to run special trains for special events such as the Madhu feast which is round the corner for people to travel directly to Madhu from Colombo", he said. Reconstruction work on the Medawachchiya-Talaimannar rail track is funded by India under the Indian Line of Credit and the 43-kilometre track from Medawachchiya to Madhu has been constructed at a cost of US$ 81.31 million. 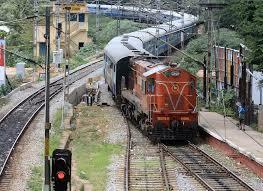 Construction work started on March 23, 2011, by the Indian Railway Construction Company Limited (IRCON). A trial run was conducted successfully on April 23 after the track was completed. There are three stations, between Medawachchiya and Madhu. They are Nellikulum, Chettikulum and Madhu. According to the General Manager of Railways , Economic Development Minister Basil Rajapaksa, Transport Minister Kumara Welgama and the Indian High Commissioner to Sri Lanka are scheduled to participate in the opening ceremony on May 14.